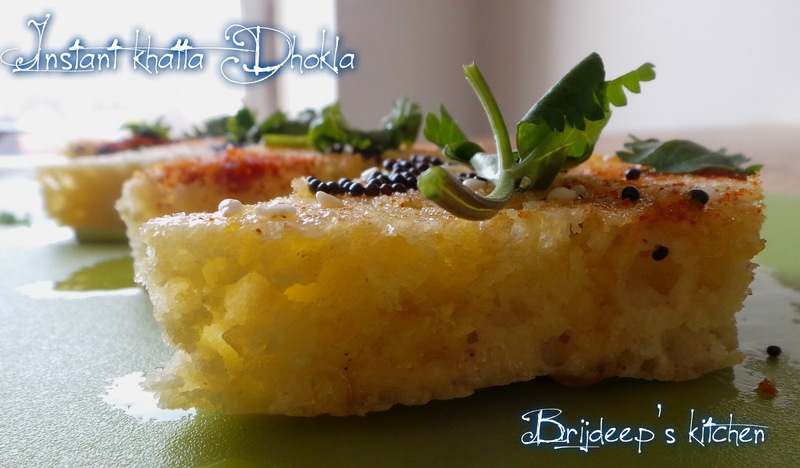 Dhokla is one of my favorite snacks because it is so quick and easy to make, light and can be easily had at tea-time. 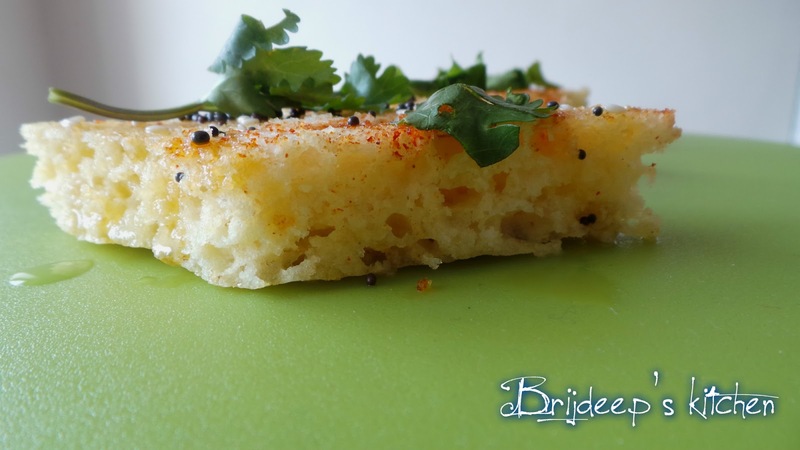 It is also really famous among my readers and the 3-minute microwave dhokla is the most famous recipe on my blog of all time!! 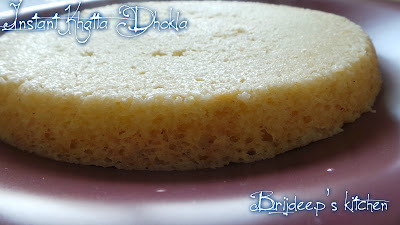 I can prepare dhokla even after I come tired in the evening because it takes just 3 minutes to prepare in the microwave. It can also be prepared in the regular steamer on stove top; I will describe both methods in this recipe. Red chilli powder: 1 tsp. Mix the chickpea flour, semolina and rice flour in a wide bowl. After 20 minutes check the batter consistency, it will be thicker because the flours will absorb the water; so add a little more water but make sure the batter is not runny. Add the eno fruit salt and stir well once and leave. Grease a microwave safe bowl with oil and immidiately transfer the batter to the bowl. Alternatively you can use a normal steaming bowl; grease and add the batter. Cover the bowl and microwave it at highest power for 3 minutes. The highest power in my MW is 750W, if you have less or more, adjust the time accordingly. 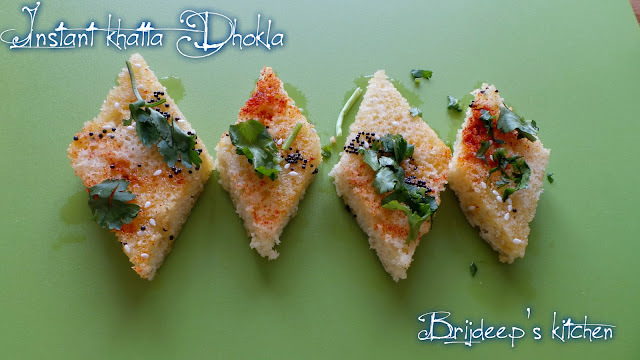 Do toothpick test after 3 minutes and if the toothpick comes out clean it means the dhokla is done. If making in regular steamer, steam for about 10-12 minutes. Do toothpick test after 10 minutes and stem until done. 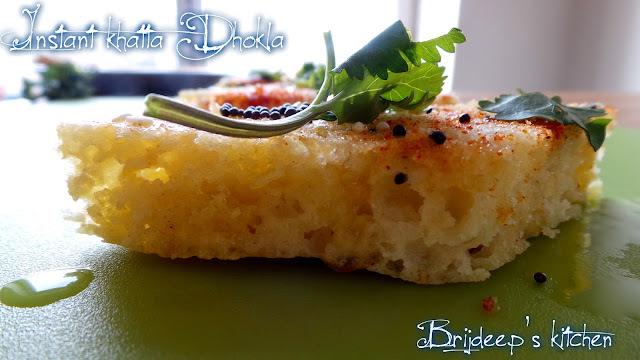 Take out the dhokla on a flat plate and let it cool for 10 minutes. Cut the dhokla into desired shapes and sprinkle the red chilli powder. Prepare the tempering: heat oil and crackle the mustard seeds and sesame seeds. Add the asafoetida and turn off the flame. 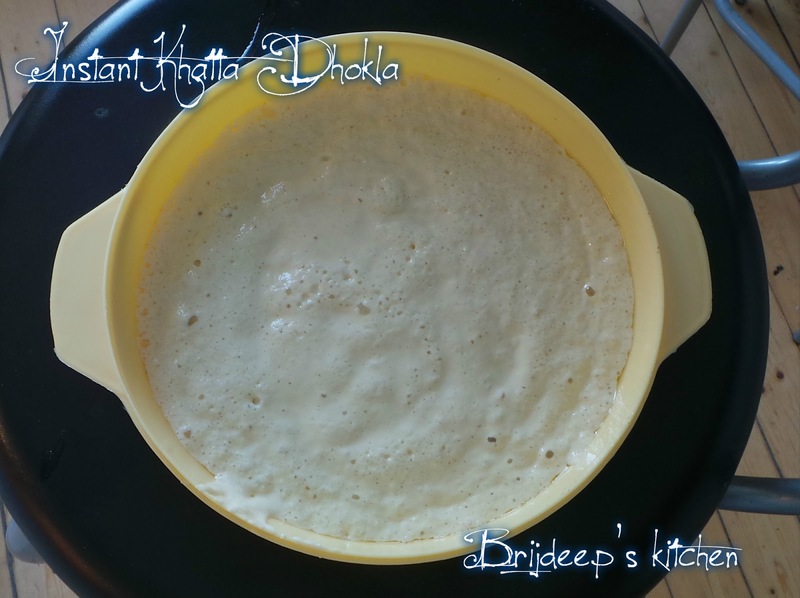 Pour the tempering over the dhokla and spread evenly. This will be a dry variety of dhokla because we don't add water in the tempering. Garnish with coriander leaves and refrigerate for an hour. Tastes best when served cold with a spicy Mint-coriander chutney and hot tea !! Loved this recipe? Please leave a comment/feedback in the comments section, it really inspires me. Don't forget to join me on my Facebook Page for regular food and recipe updates. You can share a picture if you have.. This recipe is really worth trying. 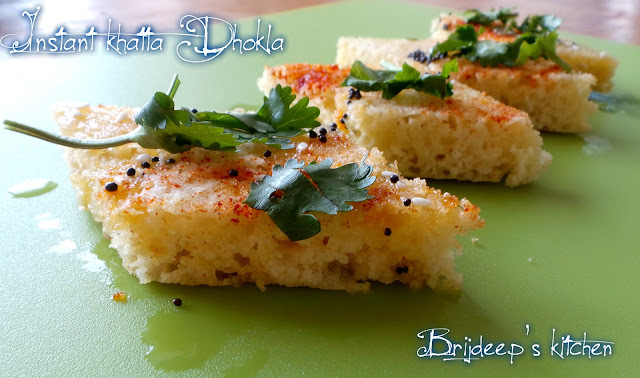 I m fond of dhoklas n this one is good. 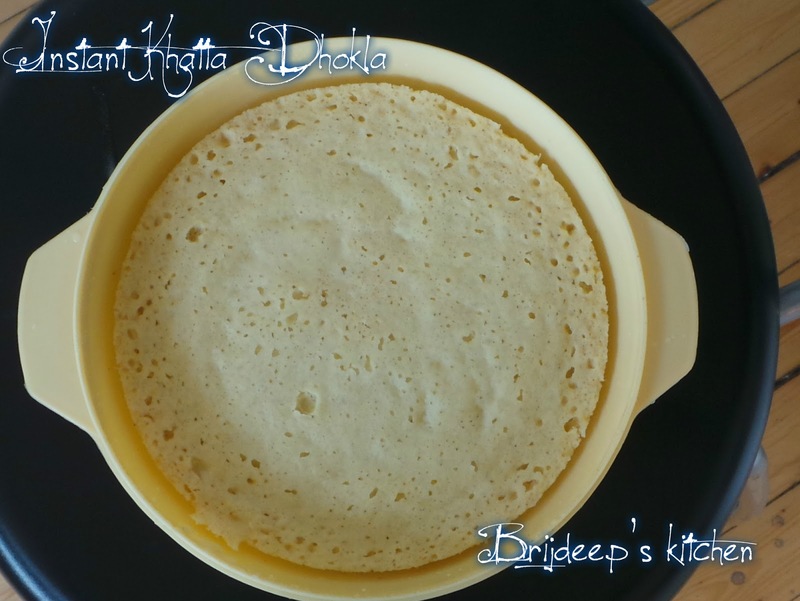 Hi Brijdeep, Do you use fine sooji/rava or the coarse one in your dhokla recipes ? Hi you can use any of them, I sometimes use coarse and sometimes fine and both turn out good. I tried ur rcp.. 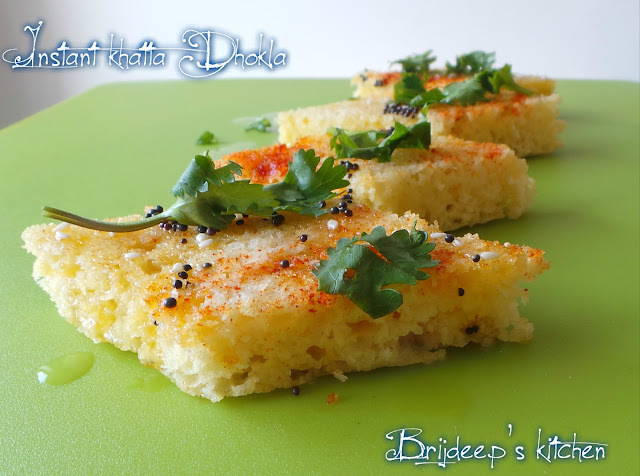 But the dhokla was very dry.. Should i add oil to it? Can I add water in the tempering to make the dhokla moist?